Traditionally, “History” refers to the era after writing (at least writing we can read). Thus, history begins in ~3300 BC. The periods before that – anatomically modern humans or not – are pre-history. I could start with writing, but it would be almost aggressively unsatisfactory. Too many interesting events – scraps, hints, relics of a human life – predate writing for us to just slit the ribbon at Uruk and start typing our story. We should, then, start with creation. In the beginning, there was a ladder. We began to climb. La Pasiega is part of the Monte Castillo cave art complex, a World Heritage site that also includes the caves of El Castillo, Las Chimeneas and Las Monedas. Together, these caves show continued human occupation through the last 100,000 years. Then again, it’s just as good as a story. Something in that image still speaks through to us. Of course, this isn’t the dawn of humanity, much less the creation of the universe, but it is the first sense we have that someone out there had a story for the creation of the universe. At least, it’s the first time we can hear them. Thus, this may not be the start of humanity, but it’s hard not to view this as the real start of human history. Now, I have plenty to say about the techniques of cave painters and their daily life and everything leading up to and after that. That’s not what this essay is for. Consider our history a kind of play, and this painting Act I, Scene 1. Before the direction and the dialogue, there’s always a cast of characters. It’s worth noting a certain irony here. It seems to me that, despite the title page reading “Humans”, none of our protagonists are human beings. They are ideals and abstracts and dreams. The very first characters are the Sun, the Moon, the Stars, perhaps, and all their representations. Water, fire, storms. Then more of the cast arrives: numerals, tools. Then crowd-pleasers: good, bad, love, authority, freedom, the unknown, the sacred. Not necessarily in that order, but certainly in some order. More appear and appear, but the original cast members never disappear. It’s a well written play, which means there are character arcs, revelations, shocking betrayals and twists – the original members, all these abstracts and ideas, change and grow. We just met one, an old one: up in the northwest corner are the stars. Of course, no one knows for sure what the paintings mean, so tread lightly there. Still. People do show up, but like all minor characters they mostly elucidate the main ones. It is not linear, and there’s not necessarily an underlying core to reveal, but why would we expect it to be? Part of this is meant quite literally: we do not have the ancients to talk to. All we have are their artifacts, and those artifacts are not individuals. I don’t mean that they’re necessarily all spiritual goods or philosophical ruminations – they may be prosaic things like “trade” and “money” and “work” but those are still not humans. In the broader sense, though, I do mean the naive and foolishly antiquated view: what makes us human is precisely that we pledge our history to our own creations. Even when we leave behind self-portraits, we can’t help but lionize ourselves with a set of symbols and motifs that speak to the abstract. We live symbolically and historically. The world we inhabit is certainly physical, but it’s not only that. Accordingly, the La Pasiega painting is the only ancient creation account that we still accept. Most of us do not believe in the literal accounts of present religions, much less the countless lost cosmogonies of older peoples. 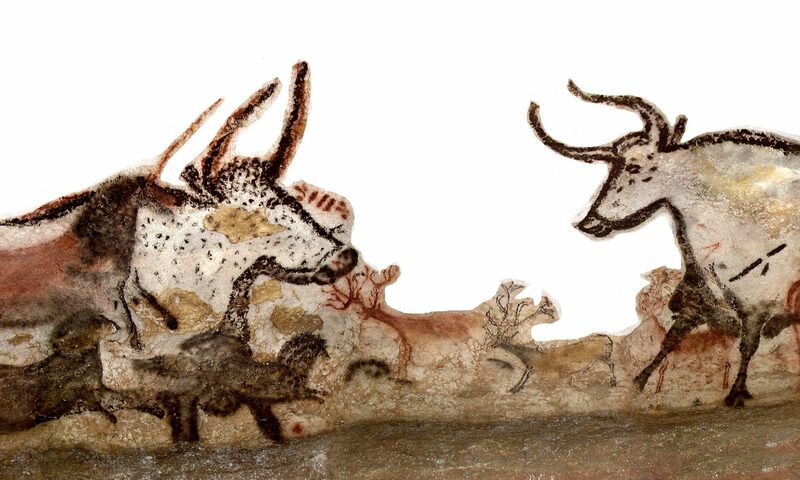 But – this one we do, the one painted on the walls of an ancient Spanish cave is still our own mythology. It still tells us that this was the birth of our world. We say: the human world must be symbolic, and it must have a sense of history, and it must provide an account. For the first time, something persists that wants to persist. And, for the first time, we let it.